They’re somewhere with a really big hanger. This is the kind of space that’s only available on, say, an Air Force Base. But it doesn’t look like Andrews, and that’s pretty much the only place around that’s got a warehouse space this big. Just before the C-Break, we get an ominous scene with an airplane screen and De Baku ordering planes in the DC area be struck down. Dun dun DUN! Junction Jack is now arguing for a pullback from Sengala, and De Baku calls. He’s delivering threats while they’re blowing up a plane over what looks like the Mall. It’s hard to judge where the plane was blown up, and what actually did the job, but I think we’re lead to believe it was fighter jets circling the DC area on alert. Secretary Stevens packs it up and heads off to clean out his desk. Thank God. A C-Break. It’s 3-0 Jack Bauer at the half-way. Jack’s back at “Northwest Field” which is probably nestled up against the Chevy Chase Country Club or maybe tucked into a corner of Rock Creek Park or something. Hey look, we’re back at the Residences with the First Dude and his son’s former girlfriend is on her way up. Creepy Secret Service Dude is setting up what is, I’m sure, going to look like a nasty accident. I thought we’d forgotten this plot point. They’re packing up the PM at the “Northwest Airfield”, and a sweet Escalade has just rolled up. They’re taking the Motobos out of the area in the Pimp Ride, but not without leaving a few extra bodies behind first. The First Dude is working hard on his Wesley routine but it still looks like the CSSD is going to hang him successfully. Well, right up until they go over the balcony edge and CSDD is impaled on something nasty, and the First Dude finishes choking him to death. And now we go into the final break. De Baku gets ready to blow up a plant in Kidron Ohio, and we’re out. One final note, they mentioned that there was no word from the White House yet, despite the plane’s proximity to the “Executive Mansion” (why not say White House? ), which means they think “Edgeborough” is in the District. There’s an Edgewood, but that’s in Ward 5, nowhere near the White House. 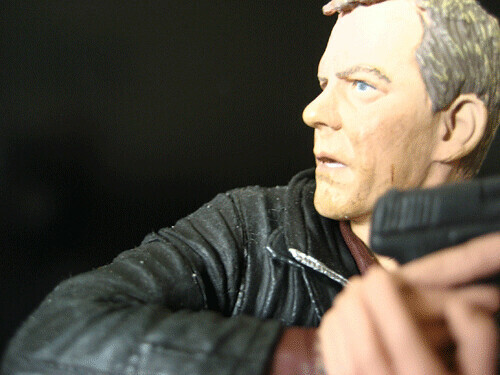 4-0, Jack Bauer. Ouch, 24, haven’t any of you been to DC? They showed a map of the DC area where this “Edgeborough” is, and it was showing it to the southwest of the city (VA), maybe inside the beltway. Because, yeah, 20 miles from the “Executive Mansion” clearly means it’s terrorist activity. LOL; gotta love the subtilty of 24 plots!